Cities and large municipalities all around the world have taken the lead in sustainability, and urban planners find themselves in the important position of having to devise solutions for integrating renewable and energy efficiency measures at local level. Each city has its own unique set of resources and pattern of energy use. But as solar energy is available everywhere to some extent, there will be an urgent need to develop the expertise and skills of solar industry stakeholders in urban planning. Researchers from the IEA’s Solar Heating and Cooling Programme’s Task 51, Solar Energy in Urban Planning, have examined the educational offerings of universities and colleges in nine partner countries (Australia, Austria, Canada, France, Germany, Italy, Norway, Sweden and Switzerland), identified gaps in knowledge and designed solutions to overcome them. “The first step in our research was to identify the tertiary education courses which currently address, to some degree, solar energy use in an urban environment,” said Maria Wall, Head of Task 51. “In a next step, we drew up a survey to get a general overview of how solar integration is discussed in teaching materials and interview educators to gain an understanding of the methods used to teach about solar energy.” This approach includes both solar electricity and solar heat utilisation. The 140-page report titled State-of-the-art of Education on Solar Energy in Urban Planning shows 284 courses dealing with solar energy in the nine countries mentioned above. The researchers realised that there had been very few courses dedicated to solar energy in the context of urban planning. Instead, most solar-related courses were taught in other disciplines, such as architecture and environmental science. They concluded that education in urban planning continued to follow long-established and well-accepted local tradition. However, research activities in the same field clearly involved a different approach, often interdisciplinary and focused on the Smart City discourse. “The current educational system has yet to catch up with these changes and move beyond traditional methods,” the researchers wrote when presenting their key findings on Austria’s educational environment. They considered the current divide between research and teaching in universities and other organisations because of a revised funding strategy to be one of the main barriers to offering a more sustainable and integrated educational platform. Several interviewees had also mentioned a lack of relevant teaching materials, something they had found to be a core problem. Neither had there been enough relevant software tools to evaluate solar urban designs, nor enough written teaching material suitable for imparting knowledge. 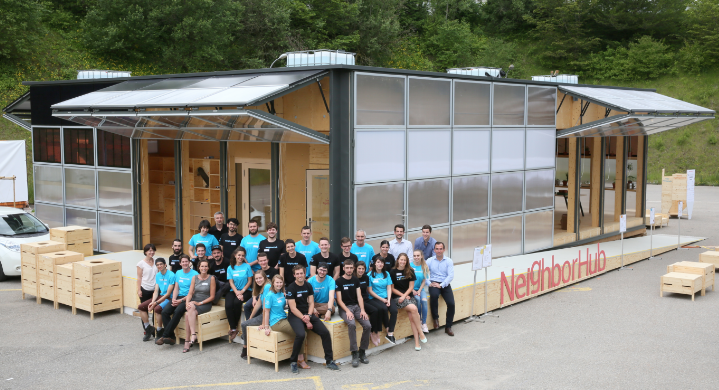 This year´s Swiss contribution to the Solar Decathlon 2017 in the USA: the NeighborHub is a place to learn, exchange and kick-start the change. It is always open to neighbours, offering space for conferences, a Repair Café, opportunities for urban gardening or eco-cooking classes. There are 3 solar collectors integrated into the facade of the wooden building and 35 PV moduls. 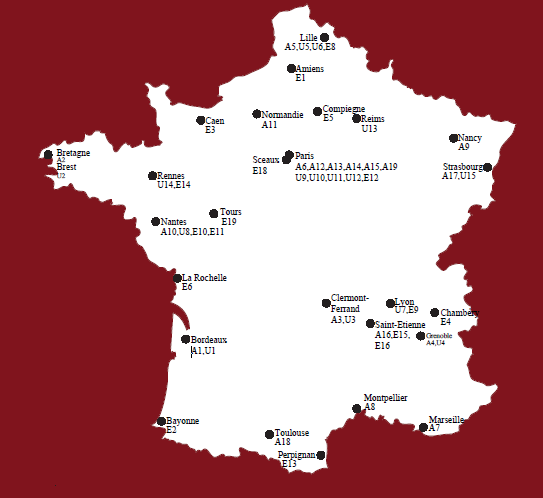 One initiative which the authors lauded above all was a project at the École Polytechnique Fédérale de Lausanne (EPFL). Several years ago, it formed a team that would regularly participate in the Solar Decathlon, an annual architecture competition. Together with the School of Engineering and Architecture of Fribourg, the Geneva School of Art and Design and the University of Fribourg, the students will take their new prototype with them to Denver, Colorado, in autumn of 2017. “Some of the most innovative educational activities have been developed in this context,” the authors said. Instructors from environmental sciences, architecture and urban design, energy and structural engineering had empowered students early on and promoted the use of innovative designs for urban scenarios. The international research programme Solar Energy in Urban Planning will come to an end this year. Solarthermalworld.org has already reported about the interdisciplinary Summer School in Berlin in September, the solar-related urban case studies – which have now been combined into one report – and EPFL’s Quality-Site-Visibility approach, which in 2016 received Sweden’s Innovator of the Year award endowed with EUR 75,000.